This 6-week online course introduces students to the role of developmental editing in academic publishing contexts, the skills needed to perform effective developmental assessments and edits on academic manuscripts, and the services developmental editors offer to academic clients. 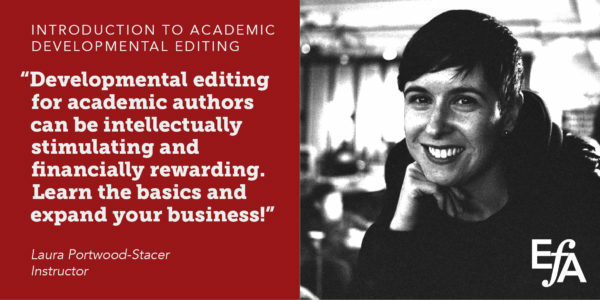 The course is designed for editors who wish to add academic developmental editing to their portfolio of services or tailor an existing developmental editing practice to academic clients. The course will also be appropriate for academics with some editing experience who are considering branching out into professional freelance editing. Understand the economic landscape of academic publishing for both journal articles and books including who pays for published academic texts. Understand the timelines, processes, and personnel of academic publishing from query to submission to peer review to production to publication to promotion. Understand the points at which developmental editors may be called on to work on a manuscript and whom they will be contracting with. Laura Portwood-Stacer, PhD, runs Manuscript Works (manuscriptworks.com), which offers freelance developmental editing services and publication consulting to academic authors. She holds a PhD in Communication from the University of Southern California and is the author of Lifestyle Politics and Radical Activism (Bloomsbury Academic, 2013), a book based on her doctoral dissertation. She has extensive experience as a journal editor and peer reviewer, including a former post as co-editor of book reviews and commentary at the journal Feminist Media Studies. Before becoming a developmental editor, Laura taught courses in media studies at New York University and the University of Southern California.